A blonde man (yes - men can be blonde as well you know) walked into the Mustard Seed, where there was an author (a very famous one of course) signing copies of her new book. In response to the mumbled request from the blonde, the author opened the nearest front book cover and wrote the dedication "to Omar Chisitt", before handing the book to the blonde. "But I was only asking how much is it? " responded the blonde. Ah - the joys of the little misunderstandings that take place between real people in real bookshops. Such joys will sadly never again warm the cockles of the White Horse EX-Bookshop, that had to recently close its doors to the public; a public that's going increasingly virtual and online. Real bookshops must absolutely loathe the words Amazon and eBay. 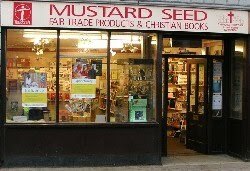 So - the Mustard Seed will now do its best - as the only remaining real bookshop in town - to continue to sow misunderstanding and confusion be a valuable resource in the community . We do have to ensure that shoppers can easily navigate their way round the aisles, so that they can see exactly where all the books are. If you look at the Shop layout (see sketch on the right) , then you can see that all the Books are straight ahead of you as you come in the door: in Bay E , and also in the Zone on the right hand side. To improve navigation, here's what we're going to do. In deference to the very popular film streaming site (LoveFilm) we're now going to call that right hand side of the shop The Zone you Love . Hang on. That doesn't sound quite right. How about adding some Latin: that's always a good ploy if you want to add a bit of gravitas. Yes, I think that should work. "You Love" in Latin is AMAS isn't it? Amo, Amas, Amat... So - we get AMAS-ZONE. Yes - that has a good ring to it. And Bay-E (or maybe E-Bay sounds better?) is pretty good as it stands. Amaszone & E-Bay. Hmmm - I like it. So - DO come to Amaszone & E-Bay to have a good nose-pick up the new 2012 Lent/Easter Catalogue at the same time. (Sorry - maybe a full stop would have worked better than a dash there ). Or browse through the catalogue online. Below is a mini digital version of the magazine. Click on the image below to view it in full. Yes, you CAN then order simply by emailing shop@mustardseed.org.uk , but remember: you may then just miss out on a good misunderstanding.